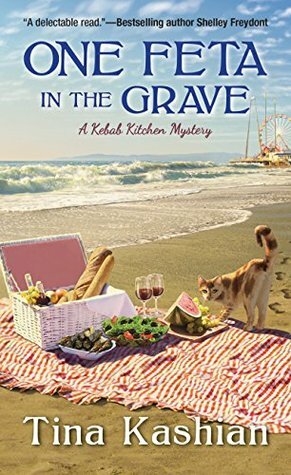 One Feta in the Grave by Tina Kashian is the third book in the cozy Kebab Kitchen Mystery series. Each book of this series centers around a different mystery so they can be read as a standalone. However, some of the character building carries over from book to book so it’s best to start at the beginning to enjoy their whole story. At the center of this series is Lucy Berberian who returned to her hometown along the Jersey shore and has taken over the family business of running their Mediterranean restaurant. Things have been going well at the restaurant so the Kebab Kitchen is going to have a tent at the local beach festival this year keeping Lucy even busier. Lucy and her friend Katie both have events going at the festival keeping them very busy but when Lucy gets the chance she decides to take a break and stroll the beach. Heading under the boardwalk all Lucy wanted was a bit of quiet downtime but instead she again finds another dead body. Archie Kincaid was a fellow businessman and just so happens someone Katie had an argument with so to get her off the suspect list Lucy and Katie again try to solve a murder. While the Kebab Kitchen Mystery series isn’t quite as over the top quirky as I am normally drawn to it still had likable characters and a charming setting that has brought me back book after book. In the second book I was a bit disappointed with the romantic angle of the plot but that has thankfully calmed down a bit in book 3 making this one a bit more enjoyable. Lucy and Katie are becoming quite the fun pair to follow so I’ll definitely come back for book 4 to see what happens next. 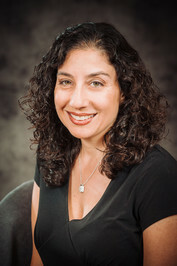 Tina Kashian, previously published as Tina Gabrielle, is an Amazon bestselling author, an attorney, and a former mechanical engineer whose love of reading for pleasure helped her get through years of academia. Tina spent her childhood summers at the Jersey shore building sandcastles, boogie boarding, and riding the boardwalk Ferris wheel. She also grew up in the restaurant business, as her Armenian parents owned a restaurant for thirty years. Tina’s books have been Barnes & Noble top picks, and her first book, Lady of Scandal, was nominated as Best First Historical Romance by RT Book Reviews. Please visit her website at http://www.tinakashian.com to join her newsletter, receive delicious recipes, enter contests, and more! Wonderful review Carrie. I read the first in this series and enjoyed it. Glad that it has continued to be a good read. I will have to catch up with this one. Thanks Carla! The second one was annoying me a bit with the love triangle forming but the third picked back up a bit.